Looking for some great action-packed summer fun for the whole family? Check out Wildwood Waverunners. We are the #1 Waverunner/Jet Ski rental company in the area. This a must do while visiting the Wildwood or Cape May area at the Jersey Shore! Riding with us is the perfect way to beat the heat, quench your need for speed, and hang loose with family and friends. Experience the thrill of flying across the water at speeds up to 50 + mph. We promise our customers a safe and enjoyable experience that they won’t forget. Wildwood Waverunners guarantees customer safety as our staff are highly trained and fully experienced. All operators and passengers will be given proper, hands on training before heading out to the riding area, and fitted with life jackets. At Wildwood Waverunners, our guides will assist you to and from the riding area, and our staff will be there to ensure that you are operating safely and are in control at all times. We provide customer safety, satisfaction, comfort, and confidence with every rental. No boating license is required! What makes us #1? We offer the areas only “no boat traffic” riding area. Maximize your riding time as our riding area is minutes away from our docks. Our facility has plenty of free parking, gender exclusive bathrooms, and a snack bar for your convenience. 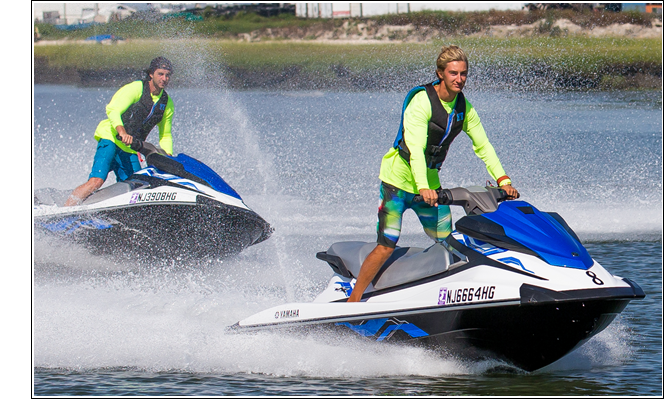 Wildwood Waverunners is also proud to offer the areas only Waverunner/Jet-Ski rentals with the areas newest fleet of EX DELUXE high performance waverunners 2017 EX DELUXE Yamaha high performance Waverunners. For an action packed adventure on your next trip to the Jersey Shore please visit Wildwood Waverunners! Looking for some other great adventures to experience? Don’t forget to check out our sister companies Thundercatdolphinwatch.com and Atlanticparasail.com both also located at 1001 Ocean Dr. Wildwood Crest, NJ 08260.